JOSH CATRAMBONE, 2:00 pm: "Vegan Seafood"
Chef, baker, farmer, Josh Catrambone has always had a passion for cooking and sharing food with friends and family. He has been vegan and mastering plant-based cuisine for the past 17 years, crafting unique flavorful recipes for restaurants as chef and consultant. He enjoys incorporating seasonal and foraged ingredients through his vegetable and fruit forward cuisine. Josh also crafts vegan meats and cheeses inspired by his family and their tradition of Italian American cuisine. Josh started cooking professionally at age 19 at an upscale Italian Bistro in St. Louis. From there he went on to work in kitchens across the country including a monastery, several diners, a Lebanese bar, pizza places, delis, bistros, vegetarian and vegan restaurants. He also cooked for the hungry with Food Not Bombs (Global). 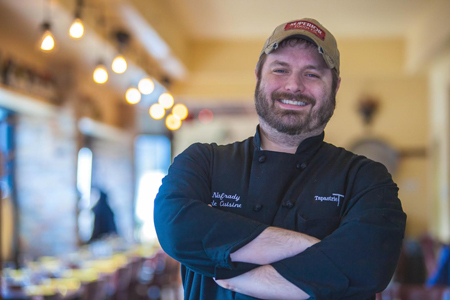 Before moving to Michigan, he was the head Chef of Karyn’s on Green and Upton's Breakroom, where he helped create products that are on store shelves across the country. Currently Josh and his wife Kerry live on a small wild permaculture farm in SW Michigan where he is baking up a storm and is the chef and owner of Water & Wheat vegan Cafe & Bakery in Watervliet, Michigan. 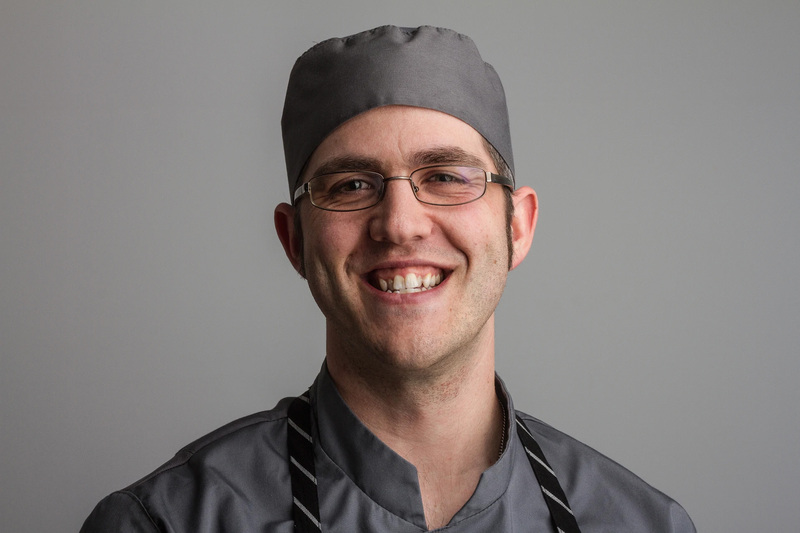 He is also the chef behind the Meatless Michigan vegan pop up dinner series! Chef Catrambone's cooking demo is scheduled at 2:00 pm. He will demonstrate how to make "Vegan Seafood." RICHARD E. COLLINS, MD, 12:00 pm: "Techniques for Vegan Cooking"
New: click here for a pdf version of Dr. Collins' fabulous slideshow! Dr. Richard Collins, also known as "The Cooking Cardiologist," is nationally recognized as an expert in heart disease prevention, cholesterol management and weight management. He is known for his devotion to creating culinary dishes using only ingredients known to promote good health. He is a Nebraska native, graduating from the University of Nebraska College of Medicine in 1968 and completed his training at the Mayo Clinic, Rochester, MN. He is Board Certified and is a fellow in the American College of Cardiology. He served in the United States Navy and was a Physician to The United States Congress from 1972 to1973. Dr. Collins has been recognized by his peers as one of the Top Physicians in America in 2012 and 2013 and was awarded Strength in Health: Physician’s Excellence in Health Care by the Denver Post, 2015. He retired from South Denver Cardiology Associates in Littleton, CO. in 2017 where he served as the director of Heart Disease Prevention and Wellness. He currently serves as a consultant to Sharecare and the Ornish Lifestyle Medicine™ program. He was one of the principal investigators for Dr. Dean Ornish’s Lifestyle Demonstration Project and The Heart Disease Reversal Program in Omaha, Nebraska from 1993 to 2003. He continues to give national lectures on cholesterol management and is a part-time lecturer at The University College of Medicine, Omaha, Nebraska, PA Program. 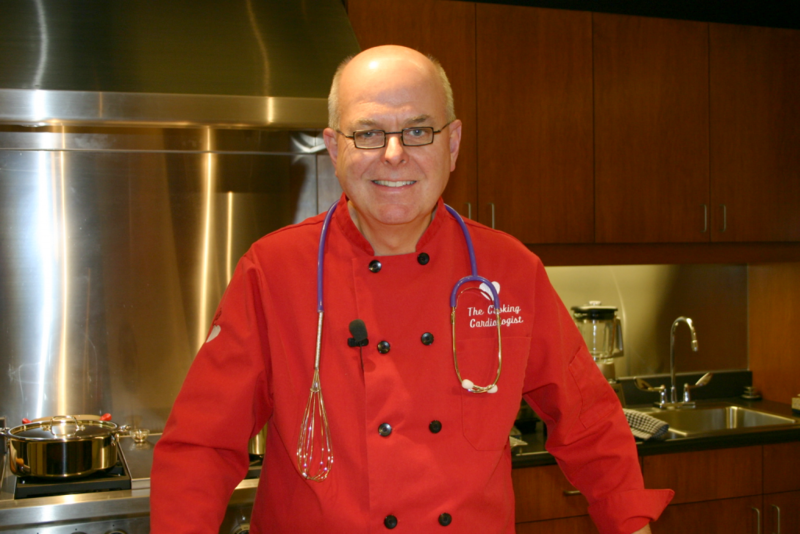 Dr. Collins has appeared nationally on TV and conducts cooking classes across America. He is the author of three nationally known heart healthy books. He is a firm believer in "looking and cooking on the light side" of life. Currently, Dr. Collins lives in Stromsburg, NE. TONY NAFRADY, 11:15 am: "Vegan Paella"
Born and raised in South Bend Indiana, Chef Tony Nafrady started his culinary career in 2006 at Knollwood Country Club in Granger, IN. 2008 was when he made a switch to downtown South Bend and began working at Fiddler’s Hearth. In 2009 he was offered a job at LaSalle Grill and continued to work there for almost two years. 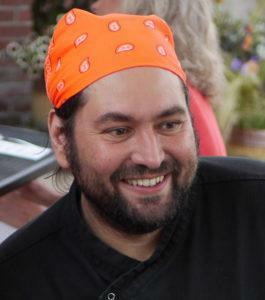 In 2011 he left LaSalle Grill and went back to Fiddlers Hearth and became their Head Chef. After four years they transitioned him to a new venture called Tapastrie where he crafted the tapas style Pan-Mediterranean menu, which contains many Vegan friendly items. Chef Nafrady's cooking demo is scheduled at 11:15 am. He will prepare a "Vegan Paella," for which Tapastrie restaurant is famous. DEL SROUFE, 1:00 pm: "Lose the Fat, Keep the Flavor"
Del’s cooking career began when he was just eight years old, creating dishes from whatever he could find in his father’s kitchen. By age thirteen he was flaunting his culinary talents by preparing family dinners, much to his mother’s delight. After high school Del shelved his love for the kitchen and sold men’s clothing while he attended The Ohio State University School of Business. Selling suits and ties did not polish Del’s wing tipped shoes so he set out to pursue his passion, cooking. He landed a position at one of Columbus, Ohio’s premier vegetarian restaurants, The King Avenue Coffeehouse, and began to establish himself as a local chef. In 1997 Del opened his own bakery, Del’s Bread, where he created, prepared and served delicious vegan pastries, breads, potpies, calzones, smoothies and other assorted delicacies to the palate of his Columbus based clientele. In 2001, Del transitioned from his bakery business to start a vegan Personal Chef Service, preparing eclectic plant-based cuisine to his already captivated audience. During this time, he developed what became a very popular cooking class series, sharing many of the delicious recipes he had created over the years with his students. In 2006, Del joined Wellness Forum Foods as Executive Chef, where today he continues the tradition of delivering great tasting plant-based meals to clients locally and throughout the continental United States. Del continues to teach cooking and health classes and is a keynote speaker at local venues and events around the country. Del is the author of Forks over Knives: the Cookbook, on the New York Bestseller list for more than 30 weeks; Better than Vegan, the story of his struggle with weight loss and gain, and how he managed to lose over 200 pounds on a low fat, plant based diet, The China Study Quick and Easy Cookbook published in May 2015, and The China Study Families Cookbook published in May 2017. Chef Stroufe's cooking demo is scheduled at 1:00 pm. He will show how to "Lose the Fat, Keep the Flavor." PAUL VUGTEVEEN, 3:00 pm: "Expansive Variety of Dairy Substitutes"
Paul Vugteveen is a skillful chef and professional consultant focused on helping organizations and businesses with analysis of their current food service programs and further assists to develop original and flavorful vegan menu options. He works tirelessly to bring high quality vegan food to his community through a range of catering services, cooking classes, and pop-up events. Chef Paul's most notable work experiences are with Pierce Cedar Creek Institute in Hastings, MI, Zingerman’s Bakehouse in Ann Arbor, MI, Avalon International Breads in Detroit, MI, and JW Marriott Grand Rapids, Grand Rapids, MI. It was during his time spent with Brines Farm in Dexter, MI, that he laid the groundwork for his critical perspective on food systems. Find Chef Paul on Facebook, Instagram, and Twitter. Chef Paul's cooking demo is scheduled at 3:00 pm. 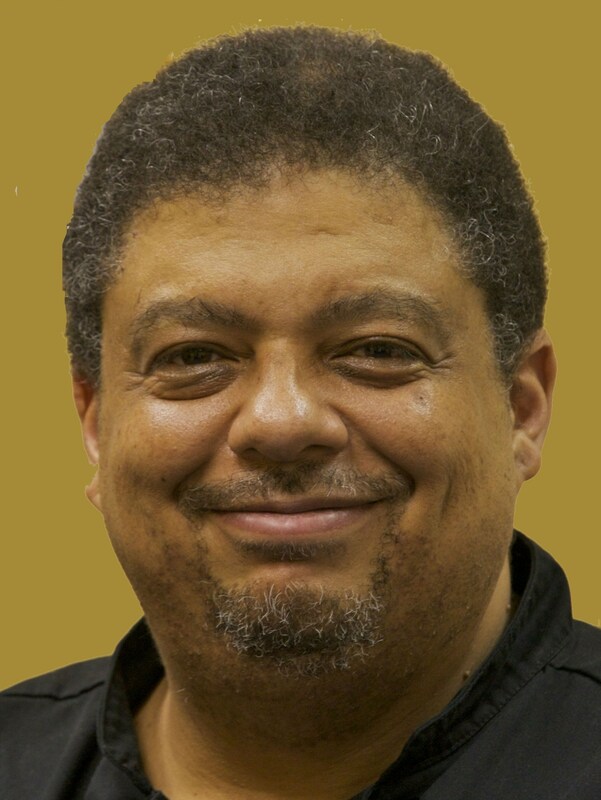 He will demonstrate how to create an "Expansive Variety of Dairy Substitutes."